The Advanced Exercise Ball Ab Workout below is a great follow up to the beginner workout. You need to have good abdominal strength and a strong core to do this workout. 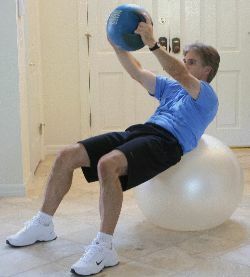 Two of the exercises included use additional resistance in the form of a medicine ball. 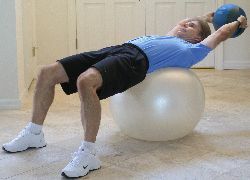 You should do the beginner exercise ball ab workout for at least 4-6 weeks before proceeding with the advanced version. The range of reps listed below are just suggestions. Go at your own pace. Modify them to fit your fitness level. Gradually increase the reps each week. Always remember: Good form is your top priority when doing this exercise ball ab workout. Do as many reps as you can using perfect form.. When your form breaks down, STOP THE SET, no matter what rep you're on. Never break form to reach a certain rep level. 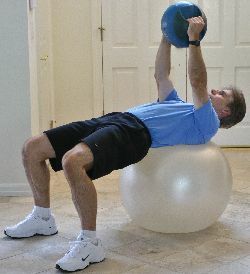 Preparation: Place an exercise ball next to something solid that you can hold on to (a weight bench works well). Lie back over the ball with your hands holding on to the bench. Head and neck should be in line with your body. Your hips should be extended to a 45 degree angle, with your knees at a 90 degree angle. Movement: Use your lower abs to raise your hips towards your rib cage, rolling up slowly until the abs are completely contracted. Pause at the top when your thighs are vertical, then slowly return to the starting position. - Use a slow and controlled movement. Exhale on the lift, inhale while lowering to the starting position. 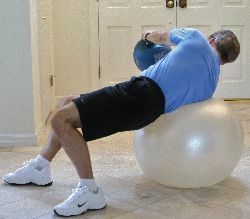 - This movement takes the most core balance of all the exercises in the advanced exercise ball ab workout. Preparation: Lie on your right side over the ball, with your body forming around the ball. Your right leg should be straight, with the left knee bent, and the feet staggered. Hands should be held lightly behind your head, with elbows held back flat. Movement: Slowly lift your body up to your left. Go as far as you can comfortably, then return to the starting position. Keep your body in the lateral plane throughout the movement. Complete all the reps for one side, then turn over and work the other side. - Exhale on the lift, inhale while returning to the starting position. - You can put your feet at the base of a wall if you need more stability to do the movement. - Focus on using your oblique and lower back muscles to do the lift. Don't use any upper body jerking to help you lift. Movement: Keeping your arms straight, slowly lower the ball down to the side, turning your upper body fully facing right. Roll up on your right shoulder. Using your abs slowly rotate your body back to the starting position. Pause in the middle, then repeat the move rotating to the left. Each movement counts as 1 rep.
- Focus on your abs doing the work, not your arms. - It's ok if your feet shift a little bit during the movement. - Start with a 6 lb. medicine ball and work up to using an 8, 10, or 12lb. ball. If you don't have a ball you can use a dumbbell. Movement: Lift your upper body forward with your ab muscles, with your arms swinging the ball forward at the same time, as if your were going to throw the ball forward. Your upper body should raise to approximately a 45 degree angle. The ball should end up at a point that's over you belt line. Arms remain straight throughout the movement. Use a moderate speed on the way up, slow on the way down back to the starting position. - Focus on using your abs not your arms. Don't just fling the ball. - This movement can also be done explosively by actually throwing the ball, to a partner or against a wall. 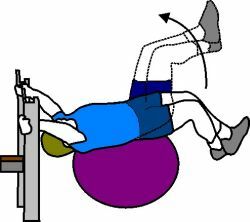 Of all the exercises in the advanced exercise ball ab workout, this is the one movement that can be done in a plyometric manner. 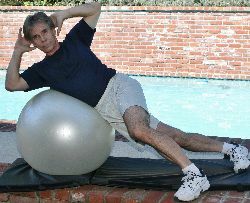 Do the Advanced Exercise Ball Ab Workout 2-3 times a week. Add it into your overall strength training program. Start with one set of each exercise for 1-2 weeks, before considering adding an additional set. Rest 15-30 seconds between sets. If you choose to add an additional set, go through all 4 exercises, then start another round. Don't do the same exercise back to back. As your fitness level increases, shorten the rest period between sets.